Take a closer look at your subject with the Canon TC-DC58D telephoto converter lens. Made specifically for the Canon G10 digital camera, the unit converts the focal distance of your lens by a factor of 1.4x when attached to the camera, making it ideal for wildlife photography and other long-distance applications. 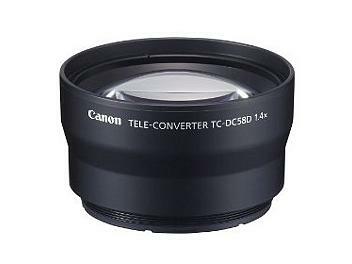 Requires Conversion Lens Adapter LA-DC58K to attach this lens to the PowerShot G10 Digital Camera / Converts the focal distance to 196mm (1.4x).